There’s a new princess in town and her name is Clara Stahlbaum of the Nutcracker and the Four Realms. Though this movie didn’t receive good reviews from the critics, it will still attract audiences, especially the younger generation. One good takeaway that people will probably get from watching it will be how amazing and magical everything looks, especially the costumes that the cast are wearing. Being the main character, Princess Clara wore several different outfits in the movie. There are her Christmas dress and the Princess dress she wore when she first arrived in the parallel world. There’s also the soldier uniform when she was on her adventure and the celebration Princess dress she wore after saving the four realms. But the main outfits that she wore for the majority of the movie is the purple dress she wore for the Christmas Party of her engineer and inventor Godfather Drosselmeyer and the Nutcracker Soldier Uniform she wore when she was retrieving her special key. Both outfits are great choices for cosplaying Princess Clara. If you want a simple but elegant looking Princess Clara, then the purple dress is your choice. If you want a Princess Clara that is ready for battle, then you will go with the soldier uniform. 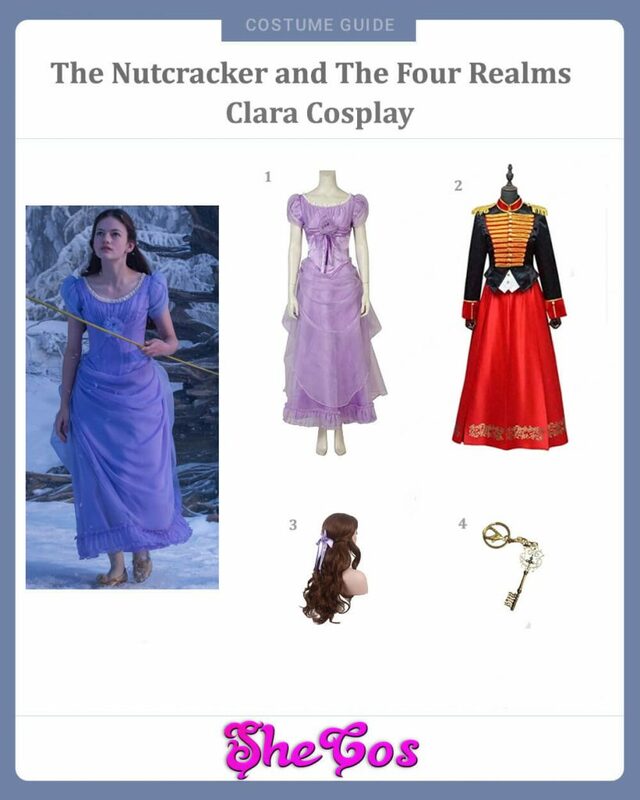 The two main outfits that Princess Clara wore in The Nutcracker and the Four Realms movie are the Purple Dress and the Nutcracker Soldier Uniform. The purple Christmas dress is basically a long dress that the character wore when she attended a Christmas Party with her family. It is also the outfit she was wearing when she first stumbled upon the parallel world. The other outfit you can wear is the Nutcracker Soldier Uniform Princess Clara wore during her quest to retrieve the special key and when she was saving the Four Realms from destruction. The uniform has black long sleeves top with big a red design in the middle with yellow lines and a red long skirt. For the accessories, this cosplay set will include a long dark brown wig and a keychain of the special key necklace that the character was searching for in the early parts of the movie. You have two outfits to choose from when you want to dress up as Princess Clara from The Nutcracker and the Four Realms. You can choose the look of Clara Stahlbaum before she knew she was a princess in a parallel world or the look of Princess Clara in a Nutcracker Soldier Uniform that is ready for battle and will do anything to defend her kingdom. Both costumes are a great representation of the main character of the movie. 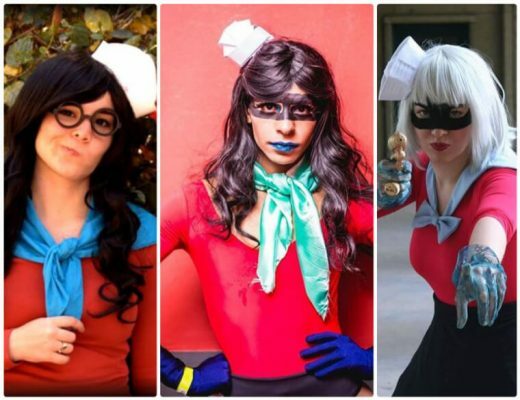 Choosing which one to wear will come down to what kind of Clara you would want to project with your cosplay. 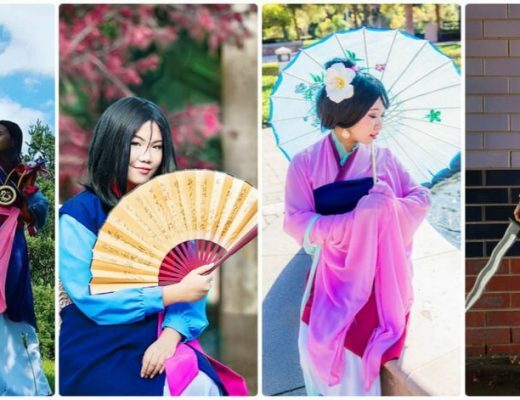 If you take a look at the cosplay photos, the purple dress is a good choice if you want to portray the ordinary-looking but still beautiful Clara. But if you want the look like the fierce-looking Princess Clara that commands an army, then the Nutcracker soldier uniform should be the outfit that you are wearing. Regardless of the choice you make, you will never really go wrong with either of them.